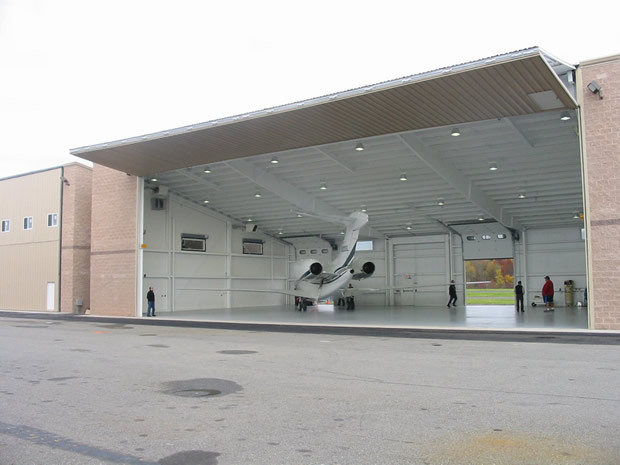 Weighing in at 16,000 pounds and measuring 80' x 27', Schweiss bifolds were the choice of several hangars that were part of a Varco Pruden real estate development project at the Morristown Municipal Airport, Morristown, New Jersey. Developer Dirk Vanversterre says the hangars were all pre-engineered steel buildings designed and constructed by Varco Pruden. Steel beams, metal roofing and decorative concrete block veneer completes the design for the five, 6,500 sq. ft. hangars which house various commercial jet airplanes. Something called a Parks 77 regulation governs the vertical height of hangars adjoining this particular strip and refers to an imaginary 7-to-1 plane from runway center to hangar. Identified as MNUFTC and located at 50 Airport Road, Suite 180, Vanversterre recalls their initial introduction to the bifold door concept was the need for a maintenance hangar adjoining their current office building. MNU is the call sign for the Morristown airport; FTC is the Flight Training Center operated by the Vanversterre family. This airport operates primarily as a private terminal for business aviation in the Morristown area. "We had seen some Schweiss advertising. An airport appraisal friend knew about them. So we made the contact for that first door and have since installed 10 more bifolds here at Morristown," related Vanversterre. "What we especially like about their design is the spacing-saving wedge when the door is open. This minimal head-space was key in the design of our metal hangars because it provided the vertical space necessary to accommodate the height of the tail assembly of our Falcon jets." FFA regulations limited the height of the hangars, yet Vanversterre needed at least 27' clear span to accommodate the Falcons. The lift-strap mechanisms of the Schweiss door not only provided the necessary clear span but also have proven to be a trouble-free engineering design. "Our pilots often comment about how quiet these doors operate," noted Vanversterre, owner along with two other members of the Vanversterre family plus Win Perkins. 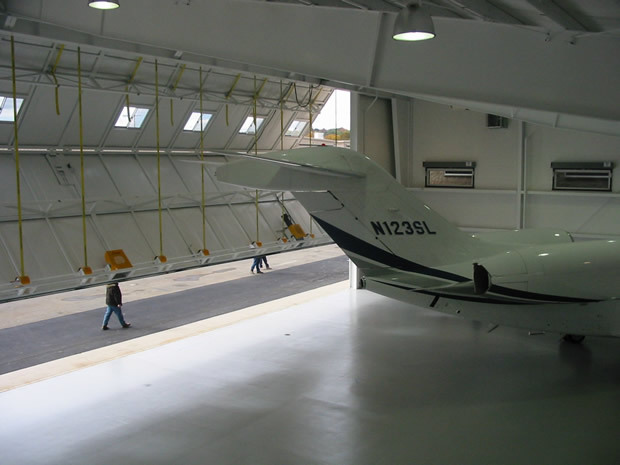 "After the first experience with a Schweiss door on our maintenance hangar, it was a no-brainer to continue with the Schweiss bifold on our subsequent hangars. Delivery has been on time. The manufacturing quality is exceptional. They simply have provided good support, good service, and a very good product," summed up Vanversterre. Construction firm for the hangars was Donald J. Parks Inc., Randolph, N.J. "We'd certainly agree with Dirk," relates Ken Parks. "Schweiss makes a good product. We've installed all 10 of the doors here at Morristown. Their upgrade from cable closing mechanism to the lift strap was a good upgrade. The Schweiss people have been good to deal with. Even though they manufacture in Minnesota, contact has always been quick and courteous." Parks Inc. does a variety of commercial construction work throughout New Jersey/Pennsylvania area including 13 airport hangar projects in three locations. Parks noted the vertical lift mechanism of the bifold door has a particular climatic advantage over a sliding door where ice or snow can happen. "We see business aviation continuing to expand. And to keep airports and hangars aesthetically pleasing yet still meeting code requirements, we as developers will continue to work with architects and building firms to stay on the cutting edge of design technology while still attractive to the local area," summed up Parks.